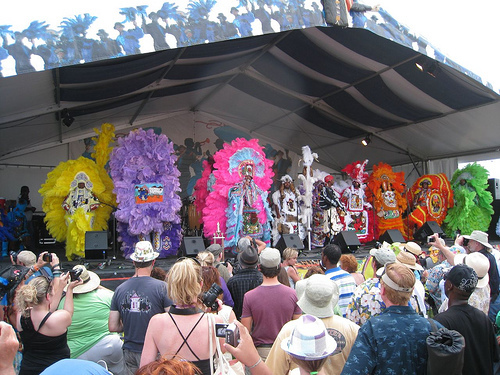 New Orleans is a fantastic city and we had a wonderful time at the Jazz Fest - or the New Orleans Jazz and Heritage Festival to give its full title. There was some concern that it might not live up to my rose-tinted memories but in the event it matched or even exceeded them. The weather was a ruler straight 28°C and sunshine the entire time, the music was great, the food was delicious and the people were friendly. So many times as soon as I opened my English mouth the person next to me would say "You're not from here. Where are you from?". "London, England" I would reply. "Welcome" was the invariable response often followed up by a friendly conversation. We saw many great acts. 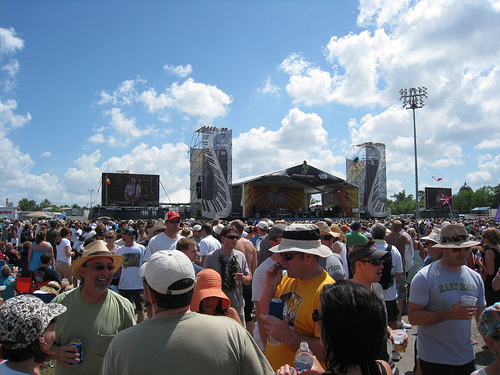 The Jazz Fest is held at the race track. Once inside you can wander all day from stage to stage with a huge array of food (and drink) stalls for grazing on some of the best cajun and creole food. Just a fantastic time. We bought a couple of folding picnic chairs, as did many, many others, and would carry them until a particular stage caught our eye where we would set our pitch and watch several acts, with occasional forays elsewhere - there were just so many acts to see. The whole atmosphere is so relaxed it was a joy to be there. NOLA is my favourite American city by a long way. It looks like it was absolutely perfect! One time, we'll have to meet there! I have a friend who goes nearly every year. And yes, NO is absolutely the best place.